Burnley boss Sean Dyche is 'open minded' about his future in football management but maintained that his sole focus was on tomorrow's clash with Premier League leaders Manchester City. The Turf Moor chief, who kickstarted his managerial career at Watford in 2011, has been heavily linked with the vacant position at the King Power Stadium this week after Leicester City dismissed Craig Shakespeare. Dyche, who was non-committal on the speculation, describing the talk as 'hypothetical', is heading the betting alongside Wales coach Chris Coleman at present with most bookmakers trading as short as 2/1. The former Hornets defender, the seventh longest serving manager in today's industry, has been a target for the likes of Sunderland and Crystal Palace in the past and claims that this situation is no different. "I don’t overthink all of that stuff," he said. "How can you design your end goal? In a normal structured role you can probably do it, in football you need so many things to come together, the perfect storm to give you that moment of success that might shift you on somewhere. "I’m quite open minded about what comes next, with Burnley, beyond that, who knows? I’m open minded about it all. "I’ve had this conversation maybe 10 times over the last couple of years. I’m still here, so I just get on with it, whatever will be will be. "It’s hypothetical. I’ve had to answer these so many times but I’m still here. That doesn’t guarantee anything, one day it will change, in my control or out of my control. "It’s the nature of football. I try and speak factually as you see it. There’s no angle other than me focusing on Burnley." It’s out of my hands. It’s a show of respect that we’re doing some good. I played at all levels. I have respect for every manager. Every manager’s job is difficult. Pep’s pressure is to win.My pressure last season was to keep the team in the Premier League. Now the pressure is to build on that. But while the odds continue to shorten on Dyche taking over the Foxes role, the numbers on the Clarets to beat City at the Etihad Stadium keep growing. One bookmaker has currently priced Burnley, who are unbeaten on the road this term, as wide as 35/1 to match what they did at Stamford Bridge and Goodison Park. 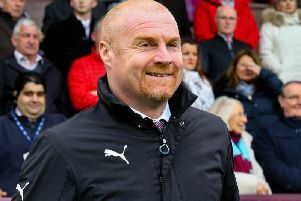 "You can plan and plan and plan, and of course we have background plans, but the main focus is always the next game and the next performance," said Dyche. "We have background work, board meetings, structure to the club, but my focus is always the next important step which is the next game. "There's nothing in my consideration other than Man City on Saturday. When the whistle blows, I’ll be ready. "There’s no fear. There’ll be respect, and when the whistle blows, the respect goes out of the window. We’ve worked very hard on our away form. It’s judged by results. But there’s no fear. Play hard, play brave. "I remember watching Barcelona a lot when I was a youth coach, and Man City look like that. They shorten the pitch well, they crunch the pitch and work to get the ball back. "When they get the ball back, they can play, and they do it very well because they have the top players. "The adjustment seems to be that compactness. When you add in the top class players… They do put the ball at risk but that’s the way they play."